How not to do much harm to career through social networking? 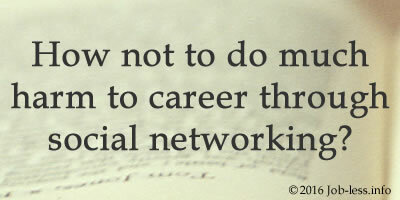 Article #7: How not to do much harm to career through social networking? Many people use social networks. You do not even think that your "inoffensive" posts, comments and likes can affect career very negatively. Someone social networks can help with useful contacts and even find a job. But it can be so if you avoid the similar mistakes. Most often at your profile the chief wishes to give a glance at the pictures. Unfortunately, even single crazy one (from some party) may strongly "shake" trust to you. So, posting personal pictures, take into consideration the reaction of your chief or co-workers. Whether you will laugh together, or it will lead to their critique? Maybe you shouldn't recklessly post such photos at all? At present it's quite normal that people should accurately choose words and phrases in virtual life too. Everyone can notice that you are discreet and polite at work, at the same time in a network you often use an offensive language. It seems that you unambiguously dissemble and hide your true nature. And there aren't acceptable worker's qualities. You are sure that don't post the "discreditable" pictures in a network, so you shouldn't worry about. Nothing of the kind! Your "careful" friends can make it instead. Thus and so, try to note in what photos of your acquaintances you are marked. Remember that the groups you are subscribed to are in full view of everybody. Even if you are very fond of a joke from a group of "Foolish", simply add it to bookmarks. Better join the group on your skills. This seems more representatively and also can be useful. Leave sharp statements and criticism towards the company or certain colleagues for personal conversation with the trusted people, but don't make them available to the public. You shouldn't slander and competitors of your organization - suddenly you may be forced to co-operate with them sometime.